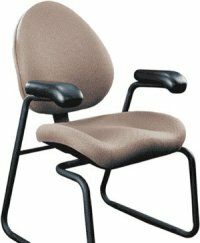 Bodybilt Ergonomic Guest Chairs set the ergonomic standards for office guest chair manufacturing. That is why we rely on Bodybilt performance, comfort and durability; and have for 14 years. BodyBilt's Guest Seating has been developed to put office guests at ease, through the same principles of ergonomic comfort offered on all BodyBilt models. Designed as a complement to BodyBilt's task and management seating, the Guest Seating Collection features a height-adjustable backrest, a choice of two different seat contours and several optional features. Use the following form to begin configuring the Guest chair which best meets your needs. Once you have made the selections below, click the "Continue Configuration" button which will take you to a page where you will select specific upholstery color and other available options.